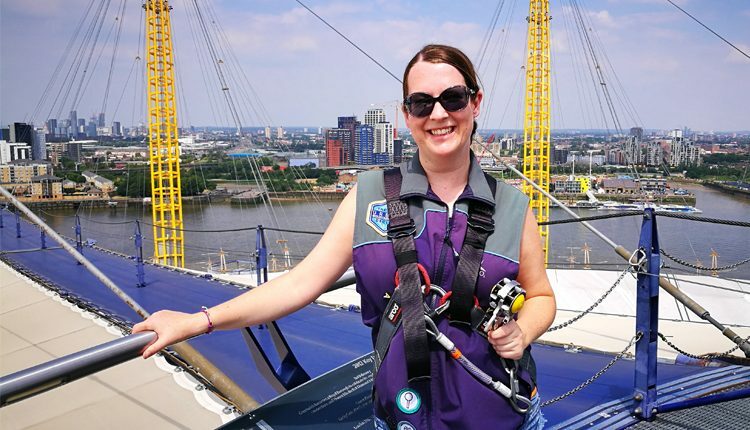 Claire, from travel blog talesofabackpacker.com, braved the heights of The O2 to help raise vital funds for Canine Partners. This is Claire’s fundraising story in her own words. I wouldn’t say I am a particularly active or sporty person, but I love to try new things and to challenge myself. I will try anything once (well almost anything) and when I heard about a challenge to climb up the O2 arena in London that was just the kind of crazy thing I can’t say no to. And the best part? I would be raising money for Canine Partners. I only learned about the charity recently, but am amazed by the work they do, training these amazing puppies to be incredible assistance dogs which transform the lives of people with disabilities. The charity doesn’t get any government funding and relies completely on donations to be able to do their work, so any money we can raise to help is all really important. On challenge day we were a small group, seven people in total, but it was great to meet other people who were passionate about fundraising, and who were terrified of heights but still willing to do this for charity! I am lucky, I’m not really afraid of heights but I find coming down the hardest part. I was a bit nervous before we started the climb, and with all the safety precautions I actually felt more nervous instead of safer! But, I was in the middle of the group, and the ones in front set a quick pace, so I didn’t really have time to think about it. Just one foot in front of the other and pausing to slide the safety clip along the railing. I didn’t keep my head down all the time though, as we climbed higher the views got better and I couldn’t resist pausing to take a look around. Our group supported each other, and we all had our purple furry Canine Partners headbands on, although it did get pretty hot as we climbed up! Once we reached the viewing platform I loved checking out the views of London, and spotting landmarks all around us. We had about 15 minutes on the viewing platform, and then we started the descent down the other side of the O2. This was actually the hardest part for me, as I could see the bottom as I was coming down and felt much less steady on my feet. The worst part was the very last section which was the steepest descent, I found it easier to turn around and climb down backwards – which also meant I didn’t look down! I took my time, and although I was the last one down I was proud of myself for finishing the challenge! I am also really proud of the money we raised for Canine Partners, enough to buy two new puppies to be trained. I am really pleased to know that what we did will really make a difference and hope I can do a new challenge for Canine Partners soon! For anyone wanting to challenge themselves, and to help a good cause at the same time, I really recommend doing one of Canine Partners’ challenges. Their next one is abseiling down the ArcelorMittal Orbit in London on 19 August, so sign up quick! Of course, you can also help without doing crazy things, donating some money or your time as a volunteer is just as valuable so you can too can help to train amazing puppies and transform someone’s life. Why not step out of your comfort zone and take on a personal challenge? The London Abseil 2018 is the perfect opportunity to raise vital funds whilst getting your adrenaline pumping.